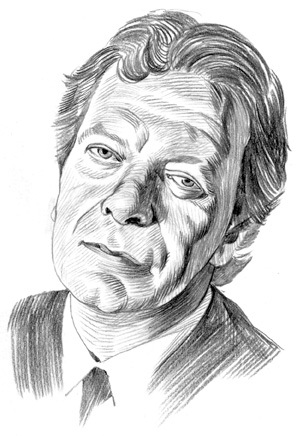 Tony Wilson, Granada Television presenter in my godforsaken city of Manchester; hippie host to groundbreaking punk in So It Goes in 1976; co-founder of Factory Records, which gave voice to Joy Division and New Order and Happy Mondays and James (and advised young Morrissey to take up novels); co-founder of the Hacienda nightclub (a dead event for years and then the place to be overnight); presenter of frontline current affairs until he was sacked as a loose cannon and a stoned liability; and lively subject of the 2002 film 24 Hour Party People — that Tony Wilson, Mister Manchester — died on August 10th, 2007 at the age of 57. His music ventures are memorable contributions to culture and ironic business failures. Punk by way of Romanticism, he seemed to feel that a truly heroic endeavor must swoon in a fey and glorious swan dive. He turned his dying into just such a noble cause: His brave and beautiful Manchester Evening News article championed the National Health Service that was treating his cancer. He publicized the plight of patients whose life savings cannot hope to afford the life-saving drug denied them by NHS authorities. Famous friends were rallying to buy the medicine he needed, but what about the nobodies with no connections? And so he gave magnanimous interviews in a wasted condition on their behalf, and then he swooned in a fey and glorious swan dive. He was called Mister Manchester because he trumpeted the city every chance he got. Even when the Hacienda was demolished, after the sit-in protest was cleared and replaced by a high-rent housing complex called the Hacienda, Tony Wilson was pragmatic. He was a product of Seventies Manchester — 1970s or 1870s, either way. A flamboyant man about town, fraternizing with rough trade: Regency long jacket and coat loping along the Northern Quarter, where his Dry Bar hosted auspicious encounters back in the Factory days, where people shop for rare records (that's what he was doing, too) and alternatives … or poised at the Green Room, up the road from the Hacienda, supporting a local artist’s exhibition … or browsing designer labels in the Triangle. A Marxist with connections: Shelley posing against the Industrial Revolution: effete and well-read friend to post-punk, bookish about records. His club could host readings by William S. Burroughs and John Giorno in the afternoon, then clear the dance floor so Madonna could Holiday for live television around the riveted stanchions that were designed, back when this city was the international capital of industry, to hold up the world. One of his local connections was Anthony Burgess. If you don't know who Anthony Burgess was, don’t worry about it — although you should probably read more. Tony Wilson ran a series that interviewed cultural figures of that caliber — that's when he pitched his name as Anthony H. Wilson, but Mancunians wouldn't buy that, and neither would Anthony Burgess, so he dropped the “H” as a concession. He ran a series that reunited George Best and Rodney Marsh to talk about the golden age of football. He fronted the local evening news program as a young kamikaze reporter, with an avuncular anchorman called Bob Greaves — as unlikely a pairing as any until Woody Allen took up with Sun-Yi. He pitched a scatty local arts and entertainment roundup called “What's On” that made his city seem like a happening, in on the launch of the prestigious Royal Exchange Theatre that landed a lunar module inside the Cotton Exchange building downtown. He featured Adam West in Batman costume and in camp character after 10 years away from the role. He hosted an impromptu Granada tribute on the day John Lennon was killed in 1980, back when spontaneity still had a slot in television programming. He also hosted a crass trivial game show, and you might give him the benefit of the doubt and imagine he was getting money together to fund some new project — when in fact he enjoyed trivial questions. But he was always dreaming of another music project, and he would even hitch a ride on rap to stay in touch. He wanted to be a catalyst again, like when he gave a bunch of godforsaken Manchester kids with guitars and voices and lyrics a most financially naive contract (read generous) and changed their lives. He was smooth, but he was sincere enough to let his business go down the pan rather than rip anybody off. “I don’t make money. I make art,” he told Hooky, bassist of Joy Division and New Order and old friend. Tony Wilson resisted how the takeovers of corporate culture make all major cities, all bookshops, all supermarkets, all networks, all café bars, all teenagers, all cultures, in the end, look and talk the same. Capitalism unchallenged promotes people’s worst fears under communism. Everybody acts and thinks the same: Manchester is a franchise of London. “It’s what we do,” Tony Wilson would say of Mancunian rhetoric that bopped Liverpool or southerners. 24 Hour Party People parodied the stance: “F. Scott Fitzgerald famously said there were no second acts. But this is Manchester: We do things differently here.” He would say all that, and stay regional, not because he was xenophobic but because he resisted the corporate tidal wave that subsumed regional identity. He launched his novelization of 24 Hour Party People in a room over Manchester's biggest bookshop in 2002, standing room only. He relished the chance to be controversial for entertainment's sake, free of the obligations of a television anchorman. (Strange to see his return to Granada Reports that year, fronting the program he hosted back in the mid-Seventies, with this Factory vibe coming around.) He talked about the facts and the legend and he fielded questions, taking his jacket off for the kind of PR effect that went out with Jimmy Carter 30 years ago. And he told the same old same old — about how godforsaken Manchester was in the Seventies before the music scene picked the city up on its feet in the Eighties. But then he made a concessionary gesture over the bookshop, sweeping his arm across the window view, "Of course, now it's become all this." He didn't elaborate. What he meant was that godforsaken Manchester is a facade without substance now, be it ever so commercial. But he doesn't do negativity, so we moved on. He was born in the same place I was born, Salford, bordering the city. He did go to Cambridge — but he came back. Roots were important. He was part of the brickwork. He lived in Castlefield, another area that has been exorcized of its working-class poltergeists for an upmarket zeitgeist, with pristine cobblestones, restored iron bridges, converted warehouses and waterways — all walking distance from the Hacienda. Factory Records predicted all that, repackaging an industrial motif for a sanitized society in the Eighties, when the manufacturing industry went to the wall. Some of the sons of those rendered redundant got a fresh start in a new direction with Tony Wilson. He was bound to romanticize the notion of working-class heroes, to make an aesthetic out of the Industrial Revolution, which, after all, started on his doorstep. The feeling from people on the street who shared their lives with Tony Wilson one way or another is that part of their youth has taken a swan dive. There was no executive separatism between the famous life of this Cambridge graduate and pedestrian Mancunians: He stayed street-level. Shelley posing against the Industrial Revolution. Part of the brickwork.